The CSSGrid control provides a grid-based layout system, with rows and columns, making it easier to design web pages without having to use floats and positioning. While regular controls (such as Buttons and Labels) can be added directly to a CSSGrid, there is a special control called CSSGridItem which is used to define sections within the Grid. CSSGridItems can be combined to make irregular sections in the CSSGrid. In the above example, the top row of the CSSGrid has been merged into a single control called Header. The CSSGrid control can be used as a wrapper for other controls you have set up in your project. Add them to the Design Screen as usual, then right click in a CSSGrid and use Add Child. The control will then move into the CSSGrid. If you reposition the CSSGrid, the included controls ("children") will move with it. Use right click Remove Child to take a child out of a CSSGrid. 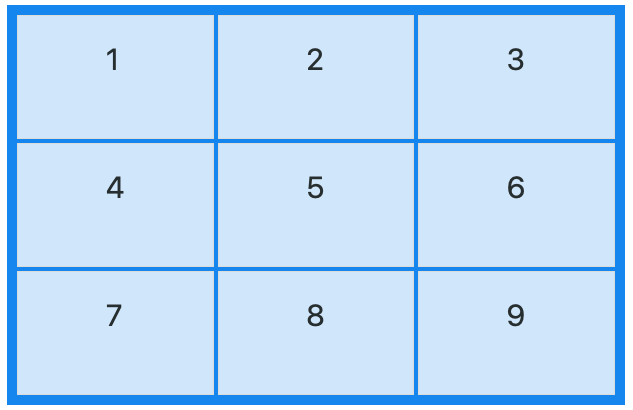 CSSGrids can contain other CSSGrids. To add a CSSGrid control to your app, choose the CSSGrid icon in the Toolbox, then position it on the Design Screen. Use the Property Editor to set the properties you need. Right click in the CSSGrid to add children. The CSSGrid will not appear properly in the Design Screen of AppStudio on Windows. The Design Screen uses IE11 to render images: IE11 does not handle the CSSGrid properly. If you run your app in Chrome, it will render properly. MacOS is fine. The alignContent and justifyContent properties define how the CSSGrid will look. Both have the same possible values. To see their effect, run the CSSGrid sample which comes with AppStudio. It has Select boxes which let you play with both settings so you can see the effect. center The items are packed flush to each other toward the center of the alignment container along the cross axis. stretch The items are shown so that the combined size exactly fills the alignment container along the cross axis. space-around The empty space before the first and after the last item equals half of the space between each pair of adjacent items. space-between The first item is flush with the main-start edge, and the last item is flush with the main-end edge. space-evenly The spacing between each pair of adjacent items, the main-start edge and the first item, and the main-end edge and the last item, are all exactly the same. alignContent The align-content property is used to align the whole grid vertically inside the container. See above for options. gridTemplateColumns Defines the line names and track sizing functions of the grid columns. gridTemplateRows Defines the line names and track sizing functions of the grid rows. gridColumnGap Sets the size of the gap between an element's columns. Can be 'normal', px, %, etc. gridRowGap Sets the size of the gap between an element's rows. Can be 'normal', px, %, etc.